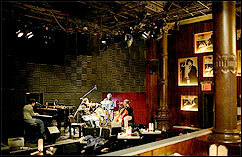 Joe's Pub at The Public Theater in New York has unveiled a new, larger stage. The old stage was 10' 1/2 x 14' 1/2 in the corner–a diamond shape. The new stage is approximately 18' 6" x 10" with a curve in the front of the previous diamond. "The new stage, which was designed by Jeff Somoya, one of our audio engineers, is rounded off to maintain the diagonal orientation of the room," says Bill Bragin, director of Joe's Pub. "It's still in the same place in the corner. Essentially the stage is a thrust with audience on three sides. We used to have stage extensions that plugged in, but they made the stage more of a rectangle and threw the focus to the front windows, rather than the center of the room. With the previous extensions, we also lost some site lines on stage right when we had a big band. We also removed the 'J-wall,' which masked the stage entrance, and flew the upstage strip lights, so we gain much more usable space, even with a piano on stage right. Now the lead singer can really be seen by everyone in the house." "In one of our first shows with the new stage, we had Roomful of Blues, and it looked positively spacious, even with their five member frontline straight across the diagonal. It's been a big boon for our modern dance series with DanceNow/NYC and our first-ever extended theatrical run of Billy Porter's Ghetto Superstar: The Man that I Am. And we'll really put it to the test next week with Travis Sullivan's 18-piece Bjorkestra, and the Either/Orchestra joined by Ethiopian jazz legend Mulatu Atatke."